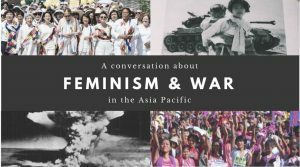 On Thursday, April 6th, 2017 Channel Foundation co-sponsored a panel discussion at the Wing Luke Museum featuring grantee partner Women Cross DMZ, “A Conversation about Feminism and War in the Asia Pacific,” along with locally based activists from LELO, NAPAWF, APALA, PARISOL, GABRIELA Seattle. World Affairs Council – Seattle also cosponsored. The event featured an evening of learning and conversation about the role of feminism in ending war and achieving peace and justice. Poet and translator Don Mee Choi opened with a reading from her collection, Hardly War. Christine Ahn, founder of Women Cross the DMZ and co-founder of the Korea Policy Institute, spoke on the current threat of war in the Asia Pacific. Local writer and activist Soya Jung moderated a conversation about feminism and war with Ahn, local Lakota organizer Matt Remle, international human rights activist Cindy Domingo, and GABRIELA Seattle’s Jill Mangaliman.